that range from precious gemstone and pearls to the latest fashion designs. Rose flower match with freshwater pearl, not only remain the elegant of pearls but also arise the romantic visual impression of rose flower. The option is given to choose sterling silver or gold plated post, it safe to the people with sensitive ears. White pearl style is the most classical and popular. All SALEWAY pearls are handpicked through natural freshwater cultured button pearls, the average size is 5.5-6mm, in great view for the Flower earrings . Jewelry comes in a beautiful gift box, perfect for giving or safe keeping. Plated silver earring backs are included in each pair earrings in package! pearl is soft and can be easily damaged, store it inside a well made jewelry box for safe keeping. 1.SYMBOL OF LOVE: The Pearl Stud Earrings with rose flower is a symbol of pure love, it stands for romance, new beginnings and bright future. It's a can be pure love expressed between love and beloved ones. 2. 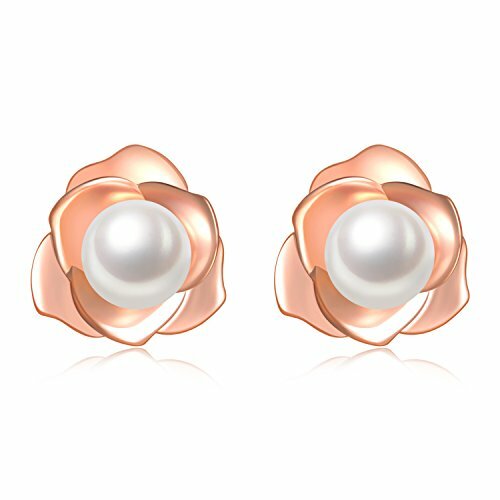 A PERFECT GIFT: This Rose Flower Pearl Stud Earrings is a perfect gift for lovers, families, and best friends on Valentines Day, Birthday, Anniversary, Thanksgiving Day, Christmas Day, etc. 3. SAFETY MATERIAL: Hypoallergenic, Nickle-free & lead-free, made of 14K rose gold plated silver without any harmful ingredients. The Flower Pearl Stud Earrings are fit for all age females and it is an appropriate stud jewelry for sensitive ears. 4. FRESHWATER PEARLS: 100% Genuine Freshwater Cultured Pearls. Handpicked AAA Quality, Great High Luster, Button Round, almost blemish free surface. 5. BUY WITH CONFIDENCE: All SALEWAY Pearl studs Earrings are strict quality checked before shipping. We provide 30 days exchange and full money refund. Please feel free to contact us without any hesitation if you are not completely satisfied with our products. If you have any questions about this product by SALEWAY, contact us by completing and submitting the form below. If you are looking for a specif part number, please include it with your message.